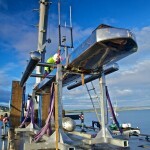 Magallanes Renovables SL is developing a floating platform to obtain energy from tidal currents. 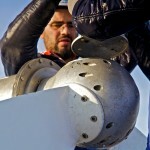 Magallanes Renovables was started in 2007. Its main shareholder is Spanish company Sagres SL and also features participation from Cardama Shipyards and CNV Naval Architects SL. 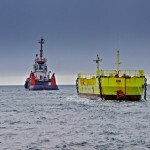 Magallanes Renovables successfully deployed its floating turbine at EMEC in November 2014, supported by the EU-funded MaRINET (the Marine Renewables Infrastructure Network) project. 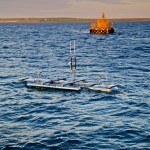 The 1:10 scale ‘ATIR’ prototype was installed on EMEC’s Shapinsay Sound test site. Magallanes has been developing their concept since 2007, having trialled previous prototypes in test tank and river conditions. The Magallanes Renovables project decided to test their 1:10 scale model at EMEC as a first step towards testing of a full-scale prototype. 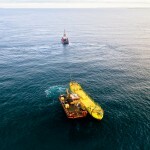 Building on the 2014 tests at EMEC, the Ocean_2G (second generation technologies in ocean energy) project aims to test, validate and pre-certify Magallanes Renovables’ innovative second generation (2G) 2MW tidal energy platform solution, progressing it towards commercialisation. 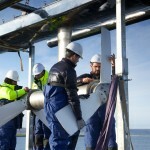 The data obtained during the initial testing programme in 2014 has been fed into the design of the second generation device which was launched in Vigo, Spain, in April 2017. The project will undertake a number of key innovations to take the full-scale prototype from technology readiness level (TRL) 6 to TRL 8, readying it for market. The second generation ATIR device was validated in a controlled environment in Vigo, Spain, where the device was manufactured. 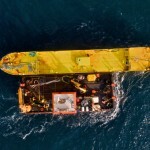 It was then was towed to Orkney in September 2018 and after months of careful planning and close working between the project partners, Orkney based marine service provider Leask Marine successfully executed the deployment of the platform at EMEC’s grid-connected Fall of Warness tidal test site in February 2019. 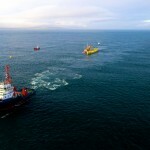 The ATIR will now undergo commissioning on site prior to being connected to the national grid, where it will then demonstrate its operational performance in open sea conditions.